Provides chicks with a warm, dry environment. Heat-resistant ceramic socket and double wire bulb guard for safety. Features 6-foot electrical cord with polarized male prongs and scratch-resistant clamp with ball joint for easy positioning. Corrosion-resistant 10.5" aluminum shade has a built-in hanger. 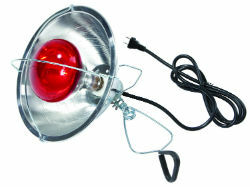 Uses 300 watt bulb maximum, sold separately.